Well, I went to 3 Sisters tonight. The play deserved a much bigger audience because it was simply amazing, Was there anything for a critic to find fault with? The set was so good, the Marc Chagall images a wonderful evocative backdrop, costumes lovely. But what really stunned me was the individual acting. Each person owned their character and played the particular role so well with distinct personality. It is unfair to single out any actors when they were all superb. And the play, subtle and in turns quiet, provocative, thoughtful, humorous. And I loved the flow of movement from one scene to another and across the stage levels with artistically framed cameos. Clever indeed. Wow it was good, a professional presentation. In fact I’m going to go again – on the last night. Congratulations! It is truly a work of art. 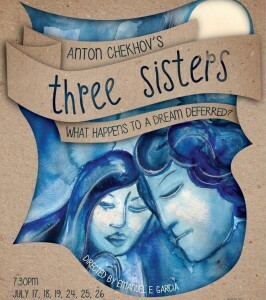 Anton Chekhov’s Three Sisters, written in 1900 and premièred at the Moscow Art Theatre in 1901 with a cast that included Stanislavsky, is above all a play about hopes and dreams. Set in a unknown town far from Moscow, Chekhov presents with subtle and challenging ‘brush strokes’, a tableau wherein quintessentially Russian characters — and therefore quintessentially universal ones — meander through lives of variegated fulfilment. The action occurs not long before the tremendous upheaval of the Russian revolution that shook the world and the interweaving of the lives of the protagonists shows a complex glimpse of a society on the verge of irrevocable change. For the BCTT production I have chosen to emphasise that aspect of the drama which Chekhov himself aspired to, namely, the fate of dreams, and with the inspiration of the images of another great Russian artist, Marc Chagall, we hope to provide an evening that will resonate for audiences in Eastbourne and the general Wellington region.